Here's some clips from some of the chatter that has been going round the internet following the release of the Game Informer news about Halo: Reach. Oh yeah, the fan boys sure got their knickers-in-a-twist about that. 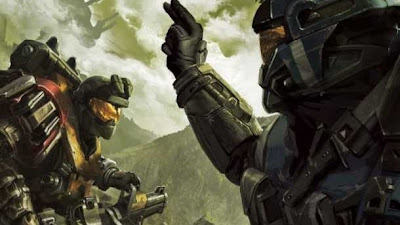 Halo Reach is produced using a new game engine so hopefully this issue is resolved. This is great news as I felt Halo have never got human faces quite right. Considering how great the vista of Halo 3 looked – the faces were down right crude. Johnson anyone? Close up journalism? Apocalypse Now? Saving Private Ryan? Forrest Gump? What? Great. Health Bars. Does Bungie think I’m getting fat or something? “Bungie's introducing stealth kills to Halo: Reach, which are context sensitive and performed by holding down a button when reaching an enemy undetected.” Oh that’s so Apocalypse now innit? Awesome, no stupid flares any more. “I’ve always thought that if there are vehicles in a game, you should be able to drive them, no matter what. It seems Bungie felt the same way. We will be able to drive civilian vehicles, alongside the more common warthog. A new helicopter transport, the Falcon, has also been introduced. Oh c’mon Bungie, hurry up and release the Reach Multiplayer Beta Test…..